Drawing shows the right and left kidneys. 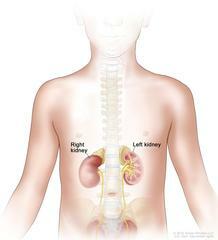 There are two kidneys, one on each side of the backbone, above the waist. The kidneys remove waste and extra water from the blood and make urine. They also help keep chemicals balanced in the body, make hormones that control blood pressure, and stimulate bone marrow to make red blood cells.